June 28, 2018 (Lepanto Institute) – Yesterday, Archbishop Wester celebrated Mass for the members of this year's Association of US Catholic Priests (AUSCP) Assembly. It is likely no coincidence that the Gospel reading was Matthew 7:15-20, which begins, "Jesus said to his disciples: 'Beware of false prophets, who come to you in sheep's clothing, but underneath are ravenous wolves.'" Sadly, His Excellency gave no such warning Tuesday night as gnostic-leaning Franciscan, Fr. Richard Rohr, denied the inerrancy of Scripture, denied the doctrine of infallibility, denied that the Catholic Church possesses the fullness of the Truth, and proclaimed the evolution of doctrine. Abp. Wester was in the conference hall for Fr. 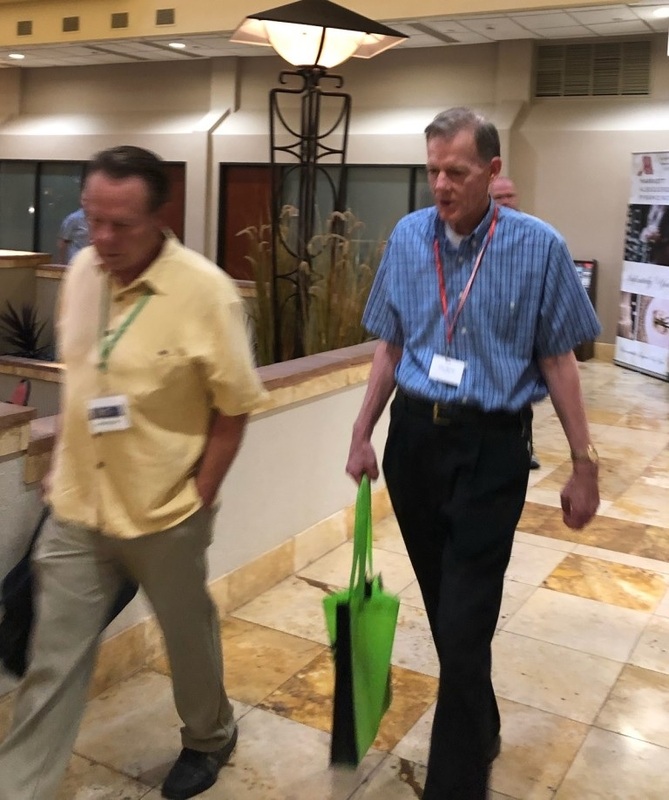 Rohr's talk, as the picture below is of him entering the conference hall. Gnosticism is an ancient heresy that denied the Incarnation because it professed the false belief that all matter was evil. While Fr. Rohr doesn't profess this belief, much of his ideas are sprinkled with gnostic teachings. For instance, the gnostics didn't deal with sin so much as ignorance. This is a theme that runs throughout Fr. Rohr's speech. Another gnostic idea is that one must obtain secret knowledge in order to achieve salvation, and again, this theme is heard all through his talk. Fr. Rohr violated Pope John Paul II's encyclical Ecclesia De Eucharistia, #30 by receiving and distributing "communion" at a Protestant service. Fr. Rohr co-presided at a "commitment ceremony" between two lesbians. Fr. Rohr's Center for Action and Contemplation hosted a workshop inspired by Starhawk, a self-proclaimed witch and neo-pagan practitioner of goddess-worship. Fr. Rohr was identified as having prayed to "Mother God" in Mass. Despite Fr. Rohr's documented history of violating Church teaching, he is still a priest "in good standing" and currently has faculties in the Archdiocese of Santa Fe. In fact, during his speech to the AUSCP, Fr. Rohr specifically mentioned that he had always had "Cardinal-bishop protectors wherever [he] has been, including our wonderful Archbishop Wester, here." Beginning at 19:15 of the video, Fr. Rohr claims that it was Protestants who "decided that the Bible was inerrant." He goes on to say that, "The Bible might be inerrant spiritually, but historically, scientifically, culturally … it's a mass of contradictions from beginning to end. Now, I won't offend Catholic by that because Catholics don't know very much about Scripture." Shortly after this, beginning at 19:53, Fr. Rohr denies the doctrine of infallibility of the pope, claiming that it was an "invention" of Church hierarchs. He said, "Around the same period that they declared the Bible to be inerrant, INERRANT! We declare the pope to be infallible." NOTE: This statement elicits laughs throughout the audience. He continues: "We both went on nineteen hundred years without an inerrant bible … So, they said 'sola scriptura,' with a very limited understanding of how a Sacred Story is communicated, and we decided that all truth could be found by making the pope infallible. Might they say, 'well, what did we do for the first nineteen hundred years? Were none of those people Christians? Were none of them Catholics because they didn't have an infallible pope?" At 26:15, Fr. Rohr claims that Christianity, including Catholicism, is a "religion of white privilege." At 33:40, Fr. Rohr twists the writings of the mystics and Scripture to assert that true knowledge of God comes from an "awakened spirit"
At 38:48, Fr. Rohr claims that people on the right are united, not because of what they believe, but because of what they're against, and he suggests that it is a unity against people like himself, those in the room that he is talking to, and that the right holds together in order to bring in "funds." At 39:25, Fr. Rohr claims that the "sin of the world" that Our Blessed Lord came to reveal is "ignorant killing; ignorant attacking anybody else." After spending over 40 minutes telling the audience that they can't know anything that is true except by an interior experience, Fr. Rohr proposes a slippery idea that truth can come from many sources, such as Hindus, Buddhists, or Protestants, suggesting that Catholics should be comfortable reading false sources in search of Truth. Here is the entire talk for those who can stomach it.